Every weekend I sit among or preach to members of our church. Many of them I know by name, others just by sight. No problem, I can always look them up in my church’s pictorial directory. That handy booklet tells me who all belongs to my congregation. It cannot, however, tell me who of them belongs to God’s church of true believers in Christ. Only God knows that. Scripture uses the word church in two different ways. It refers to the invisible church, composed of believers in Christ, known only to God. It also refers to the visible church, composed of people gathered around the Word in congregations, synodical groupings, and other forms. There’s no contradiction here. Visible groupings like my congregation are not church apart from God’s invisible church. We call these earthly gatherings church because of the believers, the members of God’s invisible church, in their midst. Scripture uses the term church in this way. St. Paul wrote “to the church of God in Corinth” (1 Corinthians 1:2). He calls them God’s church because in their midst were those who were sanctified in Christ Jesus and called to be holy. Because of the believers among them, Paul could call the visible group at Corinth a church. Yet there is a difference. Simply put, the difference is the invisible church is made up of all who are believers in Christ. Visible churches are made up of all who say they are believers in him. Sadly, hypocrites can be found in the visible church. Let’s call them make-believers, because for one reason or another they only pretend to believe in Christ. Perhaps they’re members because their parents were. Confirmation certificates may carry their name and a special Bible verse for them, but they’ve long ago left that behind. Maybe their name is on the congregational roster because of their spouse. Love for their spouse, instead of love for the Savior, brought them in. Others may be looking for the respectability and personal advantage that might come from associating with God’s people. Still others might view membership as a form of burial insurance. Though their names are on the roster of a visible church, such make-believers are not in God’s invisible church. How do we deal with such make-believers? We don’t! Remember, we can’t look into a person’s heart and identify faith. Nor can we look at a person’s life and point out faith from the works we see there. Even the hypocrite and the heathen can pursue good and honorable lives. Instead we wait and let Jesus deal with the weeds in the wheat field of the world (Matthew 13:36-43). Does this mean we show no concern toward unbelievers who are members of a Christian church? Of course not. Elsewhere Scripture tells us how to deal with openly impenitent sinners in the visible church. But with hypocrites, rather than trying to pull up the weeds and damaging some of the wheat in the process, we follow Paul’s advice and wait till the Lord comes. “He will bring to light what is hidden in darkness and will expose the motives of men’s hearts” (1 Corinthians 4:5). I can see who belongs to my church or congregation. You can see who belongs to your church too. But only God can see who belongs to his church. Pray that God in his grace keeps us in that blessed number. Pray that God sends his Holy Spirit through the gospel to sanctify and keep us in the one true faith. We can’t point out who are members of God’s invisible church, but we can point out where to find them. One time when traveling across North Dakota, I had forgotten to check the fuel gauge. Sure enough, the needle was hovering in the red. For what seemed endless miles we saw no town or filling station. Finally at an isolated crossroads stood a small convenience store with several gas pumps out in front. Imagine our relief when we saw those pumps. What should we look for to find believers who are members of God’s invisible church? Do we look at the size of the visible grouping? Its programs? Its attractive building? Its friendly clergy? Its active members? What about the one that has the best ads or is in the news regularly? Of course, none of this is wrong in and of itself. But such outward signs are not an indication that believers are present. Just as we looked for those gas pumps to find fuel for the car, so we look for the gospel to find believers. Why? God tells us clearly, “Faith comes from hearing the message, and the message is heard through the word of Christ” (Romans 10:17). Paul summarized it this way for the Thessalonian Christians, “From the beginning God chose to save you through the sanctifying work of the Spirit and through belief in the truth. He called you to this through the gospel, that you might share in the glory of our Lord Jesus Christ” (2 Thessalonians 2:13,14). These passages tell us that where the good news of salvation in Christ Jesus is proclaimed, we will find faith. And where there is faith, there is God’s church, believers in Christ. word,” God promised, “that goes out from my mouth. It will not return to me empty, but will accomplish what I desire and achieve the purpose for which I sent it” (Isaiah 55:11). Where the Word is preached and the sacraments administered, the Spirit is at work, and we can find the church, the ABCs, even if we can’t point them out individually. Now do you see why we call the gospel in Word and sacrament the mark of the church? It indicates to us where the church can be found. We still cannot look into human hearts and see who truly believes, but we know believers are present because of the gospel. Among those sitting around me on the weekend as I listen to or proclaim the gospel are members of God’s invisible church. All because of the gospel! Do we have to be told to use and preach the gospel? How foolish I would have been if I had stepped on the accelerator and driven by those gas pumps in North Dakota. Yet some church bodies around us foolishly have abandoned or looked for substitutes for the Spirit’s tools. Lord, help us remember that only through the gospel does the Spirit work to craft us and others into God’s invisible church, the holy Christian church, the communion of saints. 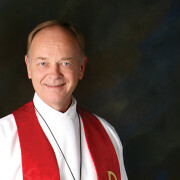 Richard Lauersdorf is pastor at Good Shepherd, West Bend, Wisconsin. This is the second article in a four-part series on the holy Christian church.